Kenneth Roth, E.D. 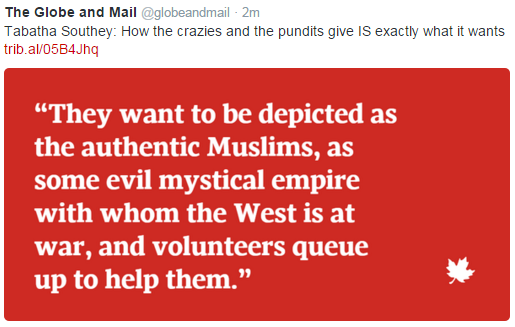 HRW (Feb. 1, 2015). Edited/Photos by Alistair Reign. Fear stood behind many of the big human rights developments of the past year. Migrants crossing the border between the Former Yugoslav Republic of Macedonia and Greece, near the town of Gevgelija, 02/09/ 2015. (Photo: EPA/ Valdrin Xhemaj). “Fear of being killed or tortured in Syria and other zones of conflict and repression drove millions from their homes. Fear of what an influx of asylum seekers could mean for their societies led many governments in Europe and elsewhere to close the gates. Fear of mounting terrorist attacks moved some political leaders to curtail rights and scapegoat refugees or Muslims. And fear of their people holding them to account led various autocrats to pursue an unprecedented global crackdown on the ability of those people to band together and make their voices heard.” said Kenneth Roth, Executive Director of Human Rights Watch in his summary of their annual World Report 2016. The report outlines and draws attention to the human rights concerns that took place in 2015 – majority of which have continued to escalate in 2016. “Focus on the need, not the numbers,” says Christian Aid. “The media of late has been full of stories of desperate people arriving in Europe, with the press focus largely concentrating on the growing numbers, rather than the conflict, injustice and oppression from which many are escaping. “(Countries are) blaming Refugees or Muslims while Missing the Boat on Terrorism,” says Ken Roth. “The estimated one million asylum seekers who have fled to Europe by sea in the past year are among the more than 60 million people now displaced by war or repression—the highest figure since World War II. “The biggest driving force recently has been the brutal conflict in Syria, due in part to atrocities committed by ISIS and other armed groups but foremost to Bashar al-Assad’s government indiscriminately attacking civilian population centers in opposition-held areas. 1 million to Lebanon where they now comprise nearly a quarter of the population. 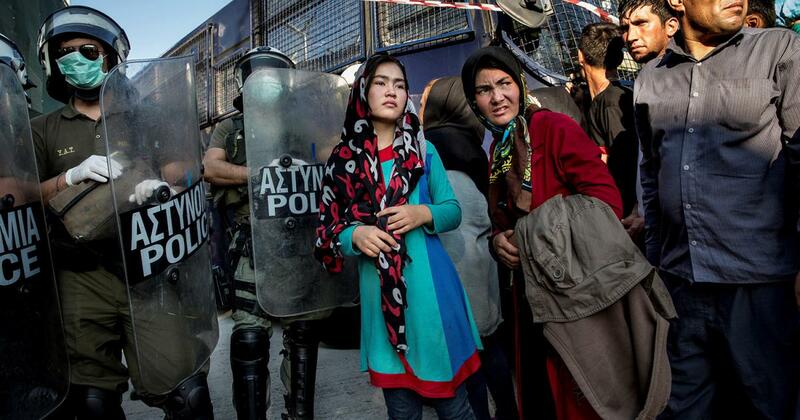 A family of Afghan asylum seekers waits to enter the Moria registration center in Lesbos. Many families with children say they are too afraid to wait in line for registration. October 4, 2015. (Photo: © 2015 Zalmaï for Human Rights Watch). “The million or so reaching Europe in the past year are just a fraction of the populations of the European countries where they are heading—some 1.25 percent of the population in Germany, where the largest group sought refuge in light of Chancellor Angela Merkel’s remarkable leadership and welcome, or 0.20 percent of the total European Union population, if resettlement sharing occurs. “To a large extent, Europe’s preoccupation with the new refugees as a possible terrorist threat is a dangerous distraction from its own home-grown violent extremism, given that the Paris attackers were predominantly Belgian or French citizens. “Public discourse has been filled with voices of hatred and fear of Muslims, for whom the refugees are surrogates,” emphasizes Roth. “These messages need to be countered foremost because they are wrong. In the modern world of easy air travel and rapidly shifting populations, Muslims are part of almost every vibrant community. Like everyone, they should not face discrimination. Roth points out that, “It is exactly the divisive and alienating response that terrorist groups seek to generate more recruits. “Muslims are often the ones most likely to learn of a terrorist threat based on radical Islam, best suited to dissuade others from such violence, and best positioned to report those who might be planning to use it. “We should learn from the abusive and self-defeating US response to the September 11, 2001 attacks—not only the notorious torture, enforced disappearances in CIA “black sites,” and long-term detention without trial at Guantanamo Bay, but also the use of immigration and “material witness” rules to detain non-citizens because of their religion or ethnicity while circumventing more rights-protective criminal procedures,” said Roth. “Discarding rights or scapegoating people of a certain religious or social profile harms those people while distancing them from counter terrorism efforts. It is the opposite of what is needed. As painful experience shows, the smart counter-terrorism policy is the rights-respecting one.” warns Roth. “Protecting Refugees also Protects Recipient Countries. 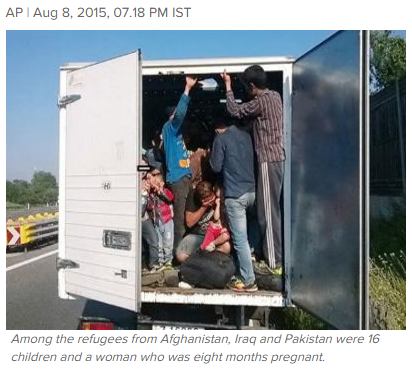 Austrian police who stopped a small truck that appeared overloaded have found 86 refugees crammed inside during sweltering heat. (Photo: Times of India). “The desperate flight of refugees and asylum seekers from unending violence and abuse in countries such as Syria, Iraq, Afghanistan, and Eritrea, and their limited chance to secure adequate work, housing, schooling, and legal status in neighboring countries, will lead many to attempt to reach Europe one way or another. “The question is whether they arrive in an orderly fashion that permits security screening, or chaotically through smugglers.” said Roth. 1/3 of them (the dead refugees) were children. “Here, too, a more orderly process, with all EU countries living up to their pledges to accept asylum seekers, would permit more effective screening, while providing a safer route as an incentive for asylum seekers to participate. “In addition, it could help to replace the current Dublin Regulation, which imposes responsibility for asylum seekers on first-arrival countries, which include some of the EU members least capable of managing them.” he continues. 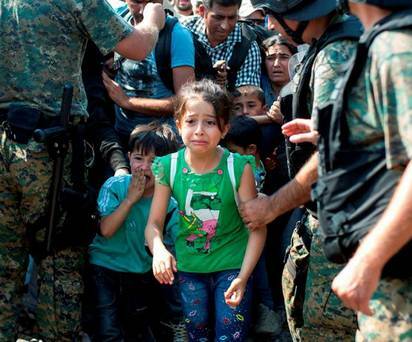 (War refugees) move past police while attempting to enter into Macedonia near the border town of Gevgelija. 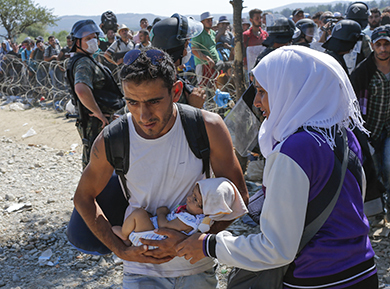 Over 42,000 (refugees) have gone through Macedonia since mid-June (2015). (Photo/credit: Independent UK). “Europe is not alone in adopting a counterproductive approach to refugees, especially those from Syria. “In the US, some officials and politicians have been denouncing Syrian refugees as a security threat even though the handful permitted into the US have gone through an intensive two-year screening process involving numerous interviews, background checks by multiple US agencies, and biometric data. “That is hardly an attractive route for would-be terrorists, who are more apt to enter as students or tourists subject to much lower scrutiny. “Of all people entering the US, refugees are the most heavily vetted,” reports Roth. “Yet, 30 governors in the US tried to bar Syrian refugees from being resettled in their states. “accelerating the reception of 25,000 Syrian refugees and spreading them to a largely warm welcome across all 10 provinces. 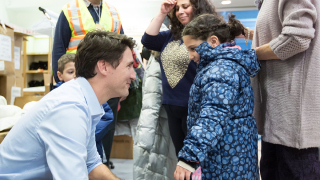 Read the recent statement Prime Minister Trudeau made at the annual World Economic Forum in regards to Canada’s response to the global refugee crisis.